If warming trends continue, Quelccaya, which until recently was the world's largest tropical ice cap, will have reached a state of irreversible retreat by the mid-2050s, according to a new study led by University at Albany climate scientist Mathias Vuille and recent Ph.D. graduate Christian Yarleque. Scientists have observed a shrinking of the Quelccaya ice cap, located in the Andes of Southern Peru, for decades. Though still bigger than nine thousand football fields, at an average altitude of about 18,000 feet, the ice cap's total area has decreased by 31 percent in the last 30 years. By analyzing future air temperature projections, Vuille and Yarleque, along with a team of climate scientists and glaciologists, estimate that Quelccaya will be losing more glacier mass due to melting, than it can make up for through snowfall, even at its highest elevation, by about the year 2055. Once the melting reaches the glacier's summit – its demise will be inevitable. "We divide glaciers into two parts. 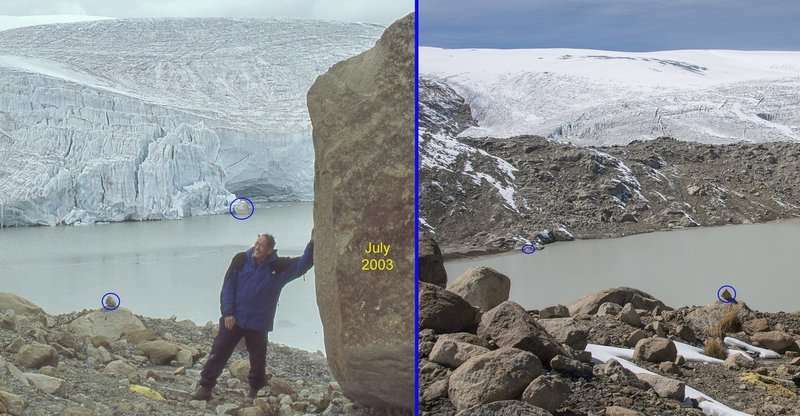 There is the higher part where the glacier gains its mass through snow accumulation, and then there is the melting at the bottom. The equilibrium line is the boundary between the two zones," said Vuille, who is a professor in the University's Department of Atmospheric and Environmental Sciences. "Our projections show that Quelccaya's equilibrium line will be located above the summit from the mid-2050s onwards, leading to its eventual complete disappearance. If we continue to burn fossil fuels at current rates, we will soon be locked into an irreversible loss," he added. According to the team's models, the central Andes can expect to see future temperature increases ranging from 3 to 5 degrees Celsius depending on the region, model and emission scenario, by the end of the 21st century. This warming will not only melt away Quelccaya, but other glacierized surface areas in the region too, including in the Cordillera Blanca and the Cordillera Ampato, where lower elevation glaciers could equally disappear. Mountain glaciers in the tropical Andes are critical for the millions of people who rely on the melting ice for drinking water, sanitation, agriculture and electricity production. Peru generates about 54 percent of its electricity from hydropower. "We often think about climate change as a problem that will impact future generations," Yarleque said. "In this case, we are only looking at about 30 years down the road. People who are living in Peru right now will be impacted by the glacier changes in this region." The melting of glacial ice that took thousands of years to form also has a symbolic meaning, according to the researchers. "The shrinking of the Quelccaya ice cap is a visual reminder of what is happening to our environment due to global warming," Vuille said. "People can see the change right in front of them." "We are not going to be able to save this ice cap without major societal changes. What we do today, matters for tomorrow," added Yarleque.